"The world is so much brighter, more manageable, and colorful too. Thanks again!" "Dr. Lapsi did a wonderful job. Very professional establishment. Highly recommend it." "I can see better than I ever hoped to again. Thanks again, Dr. Lapsi!" "Thank you to Dr. Lapsi and the staff of Omni Eye Care for a great experience!" Omni Eye Care provides comprehensive eye care in the San Gabriel Valley under the leadership of Dr. Shelly Bagai Lapsi, MD. Patients seeking specialized treatment for cataracts, glaucoma, macular degeneration, diabetic retinopathy, and dry eye will appreciate the exceptional care provided by Dr. Lapsi and her staff. Omni Eye Care offers full-service ophthalmology care including complete eye exams, refractions, laser procedures, and state-of-the-art cataract surgery. We recognize the need for personalized eye care for the entire family, encompassing compassion and focused attention to your needs. In today’s shifting healthcare environment, the continuity of care between a patient and doctor is paramount to achieving positive medical outcomes. At all times, your care will be directed under the leadership of Dr. Lapsi. Our beautiful facilities in Covina and El Monte, California, were carefully designed with your comfort in mind the moment you enter, with genuine care and exceptional support from our team. We only utilize the latest ophthalmic equipment to diagnose and treat your specific eye conditions. Our facilities also feature electronic medical records with a patient portal to optimize medical communication between our patients and staff. Dr. Shelly Bagai Lapsi, MD is one of the leading eye surgeons providing cataract surgery. At Omni Eye Care, Dr. Lapsi provides consultations and evaluations to diagnose your cataract condition and plan the best course for treatment. Early detection and diagnosis of cataracts offers you the best opportunity for cataract treatment so to avoid vision loss. If you notice vision changes such as blurred vision, halos around lights, glare while driving at night, or double vision, let Dr. Lapsi assist you today. Dr. Lapsi specializes in cataract surgery, which is the most effective solution for this eye condition. She provides phacoemulsification and extracapsular cataract extraction surgical methods. Phacoemulsification or “phaco” is the most common surgery used to remove cataracts. This method is ideal for treating cataracts in the early stage. 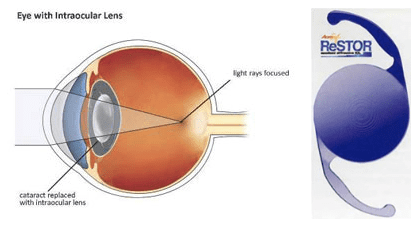 By using phaco, Dr. Lapsi can break apart the cataracts and help you see clearly once again. For more advanced stages of cataracts, the extracapsular cataract extraction is typically used. If you are ready to break free of the foggy vision you are experiencing due to cataracts contact your Covina, CA ophthalmologist Dr. Lapsi to schedule a consultation. Cataract patients now have the option of reducing or eliminating pre-existing astigmatism with the Toric Intraocular Lens (IOL). This new lens design provides quality distance vision and astigmatism correction all in one step. Imagine the ability to see your world as well as you did when you were young, without glasses or contact lenses. Being able to see all you want to see – regardless of how far away or close up you are viewing? Youthful vision is possible with the new Acrysof ReSTOR® and other Multifocal Intraocular lenses. We are excited to offer you access to your personal health information through our EMA Patient Portal. This portal will allow you to update your medical and surgical history, pharmacy information, and medication list. You will also have access to summaries of your office visits and information about your diagnoses and treatments. Please click on the link below to access the patient portal. We offer CareCredit®, a card designed specifically for your health and beauty needs. With convenient monthly payment options including interest-free options, no up-front costs, and no prepayment penalties, you can get your procedure sooner. We give you the power to decide when it’s the right time for you. CareCredit is the credit card exclusively for healthcare services. You can use your card over and over for follow-up appointments or different procedures.